The roadster roof, constructed from high pressure RTM carbon fiber, is removable via quick- release levers in the cabin, and securely stored under the front hood. Weighing less than 6 kg each part, the roadster adds only 50 kg to the SVJ coupé’s weight of 1,525 kg. The SVJ Roadster sports the Aventador SVJ’s design purity, inspired by super-fast, super- athletic, aeronautical references such as space ships and jet fighters as well as race motorbikes. 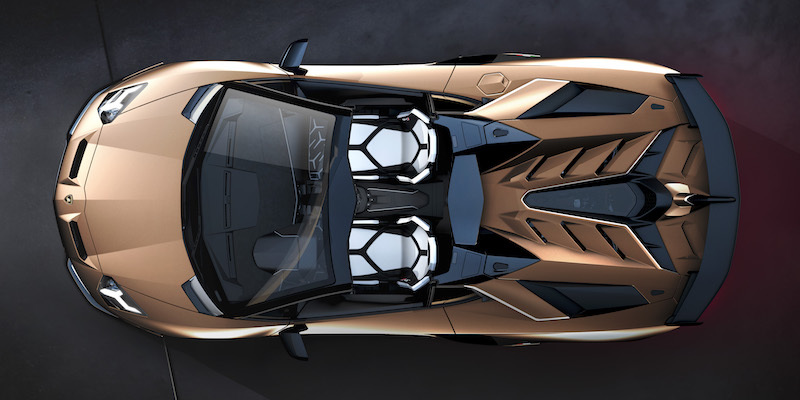 The Roadster’s lines, with roof on or off, clearly identify its aerodynamic design and superiority, delivered by the latest 2.0 version of ALA: Aerodinamica Lamborghini Attiva, Lamborghini’s patented active aerodynamics system. The V12 SVJ-enhanced powerplant, with titanium intake valve, new-shape intake runner and length, and modified intake cylinder head duct for higher flow coefficient, is visible through the lightweight carbon fiber rear engine bonnet, removable via quick release clips. The high- mounted lightweight naked exhaust produces the most emotive sound from the SVJ Roadster’s engine, adding to the experience of the roadster’s occupants.